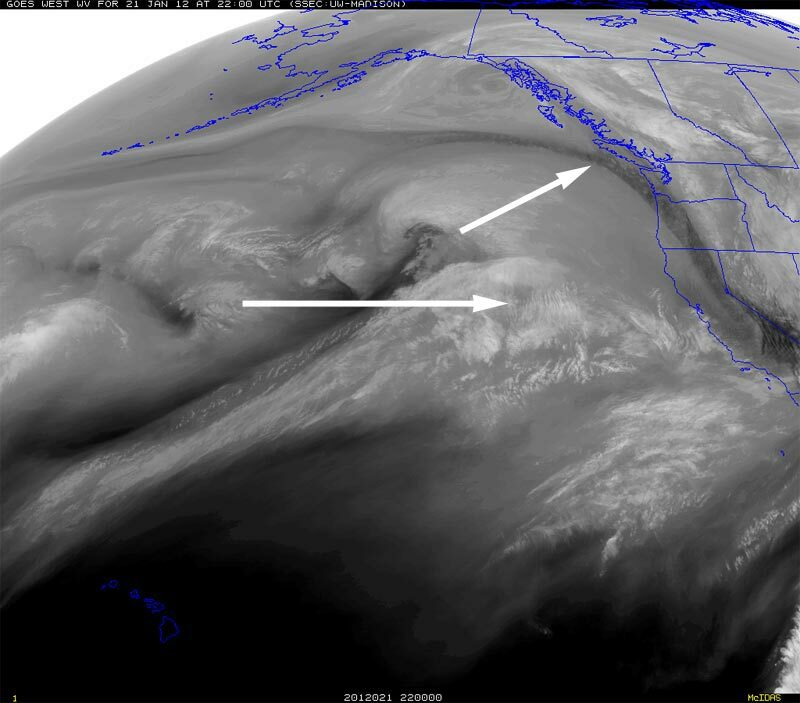 West Coast Ridge Relents, But Not Much Rain Expected South of Pt. Conception. Last Sunday's upper level low resulted in a little rain, mostly south of the L.A. basin, but Southern California and much of the West has been dry, dry, dry. How dry? Take a look at this plot of percent of average precipitation for the past 90 days from the Western Regional Climate Center. Downtown Los Angeles (USC) has not recorded measurable rain for more than a month. The last measurable rain was on December 17 when 0.01 inch recorded. The water year precipitation total for Los Angeles has been stuck on 3.76 inches, which is about 2.5 inches below normal. The Sierra has been especially dry. The Statewide Summary of Snow Water Content for January 18 reported the snowpack at 10% of normal. Remarkably, Mammoth Mountain recorded no natural snow between December 5 and January 19! The good news is the very stubborn West Coast ridge has finally relented, opening the door to a more zonal flow and a sequence of shortwave troughs. The change in pattern is forecast to produce significant rain and snow over most of the West Coast the next few days. The HPC 5-day Precipitation Forecast indicates up to about 5 inches of precipitation in some areas of the Sierra and North Coast, and over 9 inches in some areas of the Pacific Northwest. The change in pattern isn't forecast to produce much rain south of Pt. Conception, but at this point just about any amount would be helpful. BUFKIT analysis of WRF Ensemble forecasts for Van Nuys indicate precipitation amounts ranging from about 0.1 inch to 0.5 inch, beginning sometime this evening and ending midday Saturday. 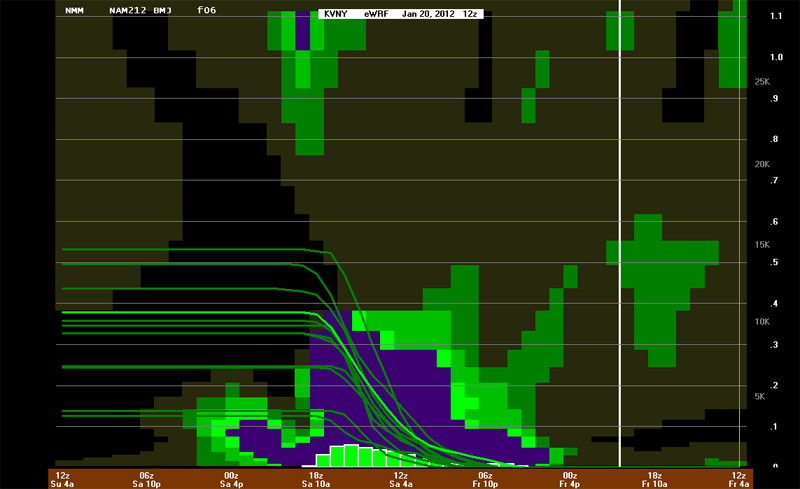 The 18z NAM precipitation forecast for Van Nuys projects about 0.25 inch for the storm. Some mountain areas could see somewhat higher precipitation totals, particularly those with a west-facing aspect. Another shortwave is forecast to move through the area Monday. Model projections differ, but we could get a little rain out of that system as well. We'll see! Update January 25, 2012 8:00 am PST. Precipitation totals across the area from Monday's system generally ranged from about 0.3 inch to 0.75 inch. Downtown Los Angeles (USC) recorded 0.62 inches for the storm. This combined with the 0.68 inches from Saturday's system boosted the water year total for Los Angles to 5.06 inches, which is about 75% of normal for the date. The medium range models have been all over the place. Yesterday the 12z GFS forecast for Monday morning depicted an upper low and trough on the West Coast, while the ECMWF indicated some ridging. Here's a GFS/ECMWF comparison from San Jose State University Meteorology. Given the recent Sudden Stratospheric Warming (SSW) and rejuvenation of the MJO there's plenty of uncertainty in the medium range. The ECMWF seems to like the idea of a relatively fast-moving trough affecting the West Coast sometime around February 1. We'll see! Update January 21, 2012 1:30 pm PST. Perhaps because its jet stream dynamics were more favorable than expected, this first system was a little stronger and held together a little better south of Pt. Conception than suggested by the models. Rainfall totals tabulated by the NWS generally ranged from about 0.2 to 0.7 inch in the Los Angeles area, with somewhat higher totals recorded in Ventura County and Santa Barbara County. Model projections have varied on the strength of the system forecast to move through the area on Monday. The 12z NAM projected about 0.4 inch for Van Nuys; the 18z NAM about 0.3 inch, and the 12z GFS about 0.5 inch. The system appears similar to today's, but it looks like the shortwave trough and vortex max may track more directly into Southern California. How Does the La Nina of 2011-12 Compare to Other Cold ENSO Episodes Since 1949? Following is a chart comparing the 2011-12 La Nina to other cold ENSO episodes that have occurred since 1949. With the exception of 1961-62 and 2008-09 the cold episodes are based on the Oceanic Niño Index (ONI) and are those specified in the CPC's tabulation of Cold & Warm Episodes by Season. A description of the parameters follows the chart. A GWO phase space plot is included for those cold episodes for which AAM data is available. Data for 2011-12 will be updated periodically. 1. AAM and AAM tendency anomaly data not available. 2. Based on ONI values beginning with DJF 1949-50. 3. ONI did not meet threshold of 5 consecutive overlapping seasons. 4. MEI values are normalized and may change as new data is added. Specified values were current as of April 24, 2012. 5. Data as of April 24, 2012. Nov-Mar AAM: The mean of the global relative atmospheric angular momentum anomaly for the period November 1 to March 31 of the following year. Data is from the GWO phase space data file linked on the Global Synoptic Dynamic Model page of the PSD Map Room Climate Products. Reference Weickmann and Berry, 2008. Peak MEI: The peak seasonal value of the Multivariate ENSO Index (MEI). Reference Wolter and Timlin, 1993, 1998. MEI values are normalized and may change as new data is added. Peak MEI Season: The peak bi-monthly season(s) for which the MEI is computed. Peak ONI: The peak Oceanic Niño Index (ONI) based on SST anomalies in the Niño 3.4 region. Reference Climate Prediction Center Cold & Warm Episodes by Season. Peak ONI Season: The peak tri-monthly season(s) for which the ONI is computed. L.A. Rain: The water year precipitation total in inches for Downtown Los Angeles (USC). Reference NWS Los Angeles/Oxnard Downtown Los Angeles Climate Page, 1921-2006 Water Year Rainfall. GWO Phase Space Plot: Plot of global relative atmospheric angular momentum anomaly vs. global relative atmospheric angular momentum tendency anomaly for the period November 1 to March 31 of the following year. Data is from the GWO phase space data file linked on the Global Synoptic Dynamic Model page of the PSD Map Room Climate Products. Reference Weickmann and Berry, 2008. Los Angeles Rainfall Now Falling Behind. Postcard Weather for Rose Parade. 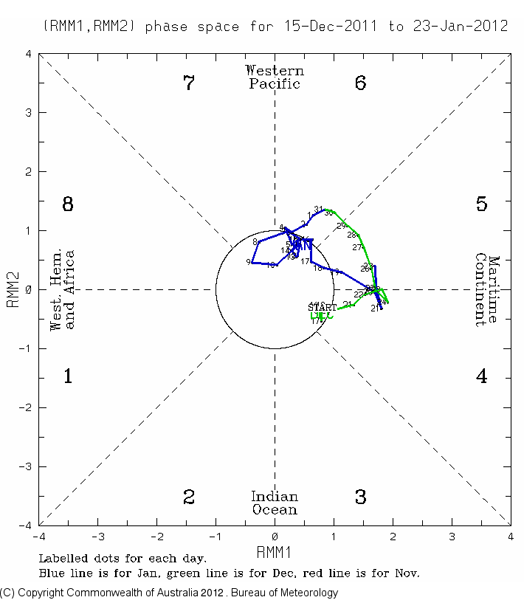 MJO Active Again, but for How Long? Millions in Damage from Downslope Windstorm. There's been no rainfall recorded at Downtown Los Angeles (USC) since December 17 when 0.01 inch recorded. Los Angeles ended December with 1.01 inch of rain. This is less than half of normal for the month and far less than last December's deluge of 10.23 inches. Even though December 2011 was somewhat dry, it comes nowhere near setting a record. Since 1877 there have been eight Decembers in which no rain was recorded, and 44 Decembers with 1.01 inches of rain or less. Downtown begins 2012 with a water year rainfall total of 3.76 inches. Last year we would have said this was near normal, but using the new normals derived from 1981-2010 data the total is 0.56 inch below normal. It has been several years since Downtown Los Angeles (USC) recorded below normal rainfall for the first six months of the water year. The last time was July 1 to December 31, 2007. In a word the weather for the Rose Parade is expected to be SPECTACULAR. The current NWS point forecast for Pasadena is calling for an overnight low Sunday-Monday of 54 and a high Monday of 83. Click here for the latest NWS forecast for Pasadena. The MJO has been relatively active this autumn and after going on a two week holiday appeared to be more coherent as it moved into the Western Pacific between Christmas and New Year's. However the NCEP GEFS and several other models forecast the MJO to rapidly diminish in amplitude and eastward propagation. At the moment the precipitation outlook continues to be on the dry side. We'll see! The November 30 - December 1, 2011 downslope windstorm felled thousands of trees, produced multi-day power outages and resulted in millions of dollars of damage in valley communities along the San Gabriel Mountains. An initial analysis of the conditions leading up to the event suggest a combination of factors contributed to the strength of the winds. 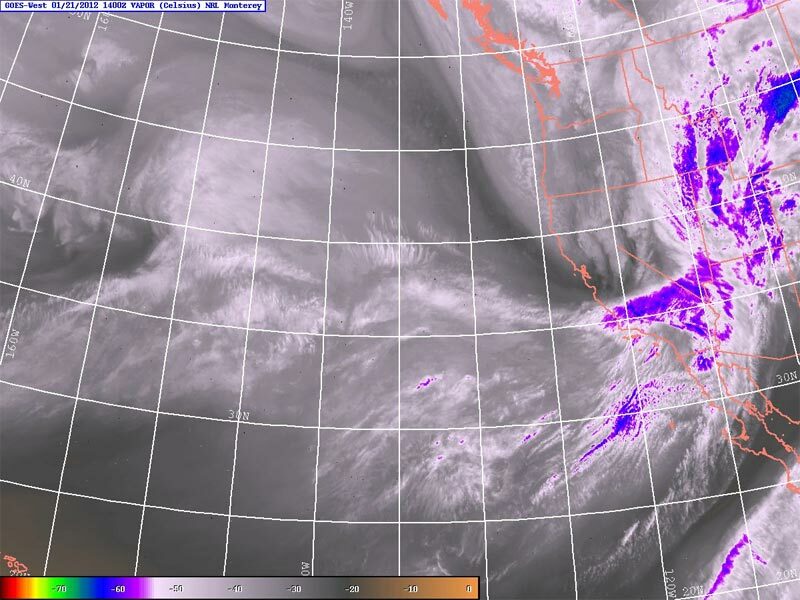 Among them were a highly amplified and energetic north-south upper flow which was evolving into a cutoff upper low over southeastern California; a deepening surface low south of Las Vegas; cold air advection; and a possible inversion near mountain-top level.